Maximize Your Closet Space. Maximize Your Peace. 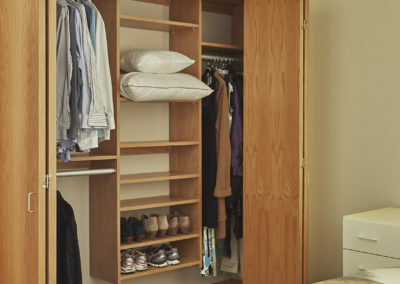 Your closet is a often overlooked but extremely important room in your home. Your day begins and ends in your closet–that’s why it should be organized, peaceful, and even beautiful. We create beautiful and functional closet organization systems for your walk-in or reach-in closets, no matter what size. Our goal is to create a closet where you can easily find what you need and take control of your morning routine. The first step to your new dream closet is to set up a FREE consultation with our designers. We’ll sit down and discuss your ideas, and come up with a plan that fits your vision and budget. There’s no obligation, so why wait? Contact us today!